Copyright © by Michael Sweere. All rights reserved. I’ve always wanted to be an artist—I’ve known this since I was quite young. For the next 15 years the commercial world took precedence over my fine-art passion. I advanced my career, became an art director, and worked for several large firms. 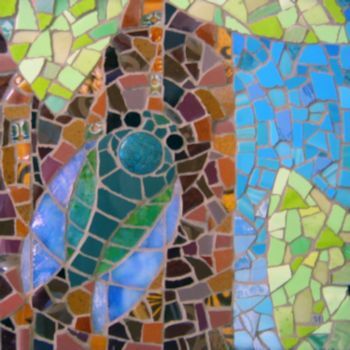 In 2005, I was awarded my first commissioned mosaic assignment. 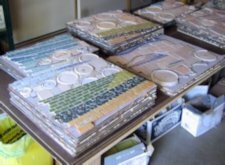 This opportunity allowed me to resign from advertising and to establish the Michael Sweere Mosaic Company; and I’ve been creating original artwork on a full-time basis ever since. I work in several media: drawing, painting, mosaics, and collages. Much of my work incorporates recycled and salvaged objects—locating this material is a favorite pastime. I frequent salvage and thrift stores looking for dinner plates, tin objects, old books, lumber, and ceramic tile. Often, my creative process unfolds with the discovery of new materials. It’s fun, it’s unpredictable, and it always keeps things fresh. As one who is fascinated by “prettier” bugs such as honey bees, I just had to see more by this artist. One link led to another, and I soon fell willingly into the vortex of Michael Sweere’s quirky collages and lush yet elegant landscapes, where I was glad to linger over their nuances of light and shadow. And to marvel at their creative upcycling of discarded and found objects. Sweere’s works incorporate a range of media which are typically ignored by the majority of other fine artists: vintage buttons and pearls, pebbles and agate slices, broken plates and ceramic tiles, tin cans and cookie tins—even salvaged paper products, such as cereal boxes and UPC codes. 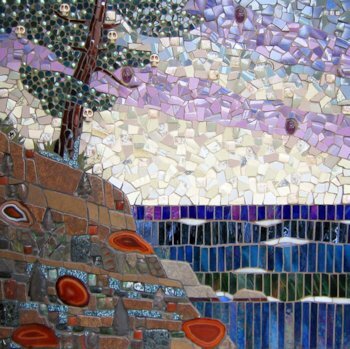 One of the mosaics reproduced above, Gichigami (the Ojibwe name for Lake Superior), incorporates skull-shaped beads—which I speculate may refer obliquely to the historical practice by some indigenous peoples of burying their dead on scaffolds or in trees. Or maybe the skulls symbolize the spirits of sailors drowned in shipwrecks. 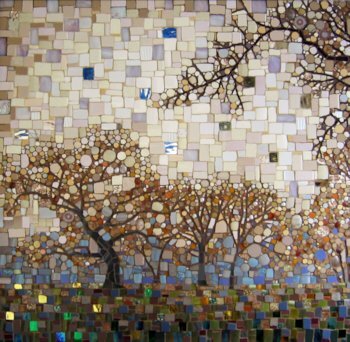 Sweere also populates his mosaic landscapes, both natural and urban, with depictions of various denizens of forest and lake—fin, feather, fur, and fern. Other insects appear as well: fireflies, dragonflies, and even a beetle or two. Within 24 hours of discovering Sweere’s works, I was thrilled to receive permission from the artist to include four of his images in KYSO Flash’s first issue—plus, the journal’s color scheme was in place on the drawing board: shades of blue, green, and burgundy-brown inspired by Cicada. At eight inches by eight inches, Cicada may be the visual-arts equivalent of a prose poem, yet Sweere enjoys working at the epic scale as well. His largest work thus far, Over the Treetops! is about 8 feet tall by 18.5 feet wide. The piece was installed in June 2014 at the Fort Dodge Municipal Airport in Iowa. I built it piece by piece in my studio. 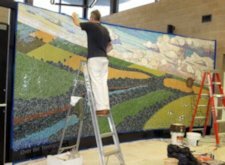 The mosaic was constructed on 36 individual flexible, fiberglass mesh sections—each approximately 24 inches by 24 inches. When it came time to transport, I was able to fit all 36 sections and my tools in one truck. The actual commute was a bit like “driving the dynamite truck”—[but once the mosaic was] at the site and unloaded, I was able to relax. The 36 sections were then re-assembled in order, like a big jigsaw puzzle, and attached to the wall with concrete mortar, grouted, polished, and sealed. The trickiest part is working with the builders to make sure that the wall is square and prepared properly—then making sure the measurements all add up. I’ve done several big wall installations and every time I learn new tricks. The 36 panels of Over the Treetops! in the studio; and during installation. 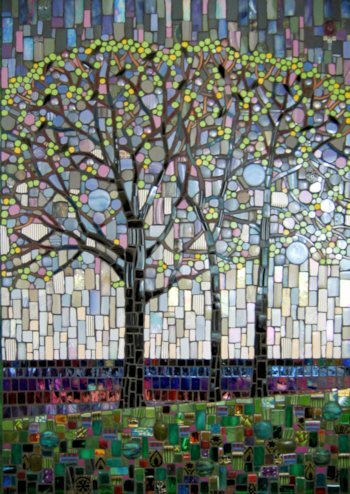 His work also has been featured in Art & Antiques (“Emerging Artist,” May 2004) and Mosaic Art NOW. 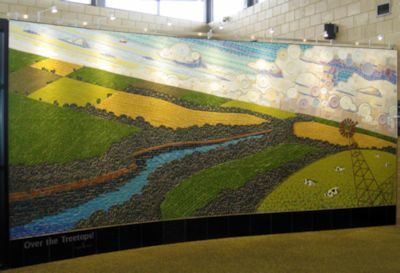 In this four-minute video at vimeo.com, Sweere talks about the grant process for the art panels he designed to be “durable and interactive” at the Carl W. Koenig Interpretive Center in the North Mississippi Regional Park. ⚡ Several of Sweere’s small-scale works, including Cicada, are available for purchase through Sivertson Gallery. ⚡ The Bougie Studio: Continuing a Long Tradition of Training Painters by Peter Bougie; this detailed curriculum description was originally published in 1998 in Resource Library Magazine.